I was grateful for the tip about the grids on Lynn Fraley’s blog. In the previous post, you can probably see the bubble wrap lining the smaller damp box. That had been my own solution for keeping the greenware elevated from the damp plaster, but I can see her tool will work so much better. It also reminded me that I’ve meant to share some of the tools I’ve come to depend on for some odd jobs around the studio. Since I’ve been absorbed in mold-making these last few weeks most of these are tools used either for that or for prepping the resin masters. Although they are here with mold-making tools, I really use these for everything from cleaning masters, to polishing plaster to cleaning greenware. They often aren’t sold by standard grit numbers, so I like to buy them in person by feel, and I use all kinds. Often I cut them into small strips and round the edges (a big help when they are used on soft greenware, since the corners can gouge), then strip off most of the padding from the back. I find for some tasks I need them a little more flexible than the thick layer of foam allows. This is another all-purpose tool in the studio. It’s primary purpose is to mask off bisques during underglazing, but I also use it when I want to clay up a resin original. 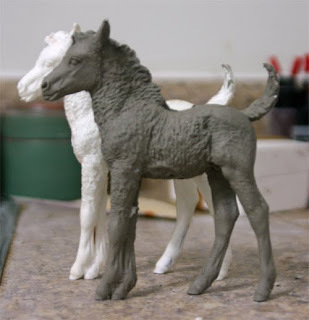 The blocking clay I use, Plastalina, is really soft and sticky, so I find that masking areas with deep grooves (like the mane or the eyes) before I place that side down in the clay makes the later clean-up much easier. Just be careful to keep it well away from the mold lines, since the seal against the master needs to be tight there. The exposed face of the resin master tends to get clay residue as well, especially near the mold lines. To clean those places without disturbing the clay, you can paint the latex over the area (including the plastalina itself) and allow it to dry. When it is peeled off, it takes the residue with it. The small square under the Miskit bottle is a rubber cement eraser, which is useful for removing dry latex. It is quite rigid, so it can be cut into shapes to reach tight areas. 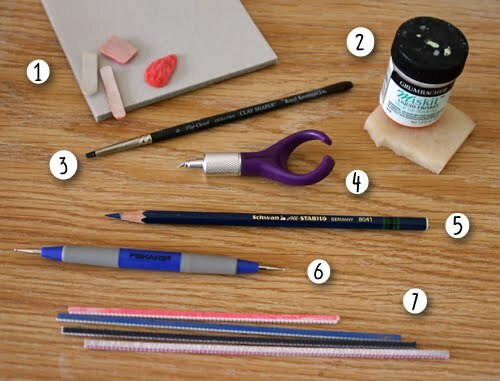 These tools are really popular with sculptors and can be purchased with different tips and with varying firmness. I use the smallest firm (black) wedges to apply the liquid latex. The have just enough give and dried latex peels right off of them. I found this tool, made by Fiskars, at a scrapbooking store and immediately fell in love with it. (That hobby has more cool tools!) The tiny blade is just the right size for cleaning seams, and the loop that fits around your finger braces the knife in a much more controlled fashion than an ordinary Xacto handle. Even better, the blade can be positioned at any angle to the handle, so it is perfect for getting into tight spots. It was made for cleaning out the “keyholes” in manes and tails – and Oliver’s crossed legs! 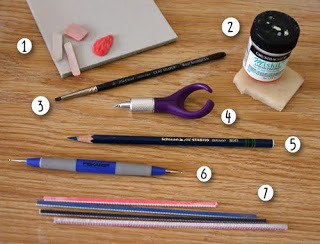 We used these water-soluble pencils at my family’s sign shop to mark cut lines. They were great because they gave a very visible blue line that didn’t brush off easily, but could be removed completely with water. I use them to help mark out mold lines on resin masters. I can see the lines more clearly than with a regular pencil, but I can still remove the marks (or change them) when I am done. This is another cool tool from the scrapbooking store, also made by Fiskars. One of the most time-consuming – and truly boring – tasks in making molds is sealing the mold boards. The clay needs to be sealed against the edges, as do the corners of the box. 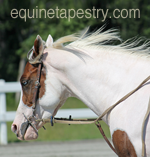 It has to be done reaching inside the box, and without bothering the soft clay around the horse. It is messy work, and it always left a messy edge around the rubber master. Now I just run the larger end of the embossing stylus along the seam, and it makes a clean seal in minutes. 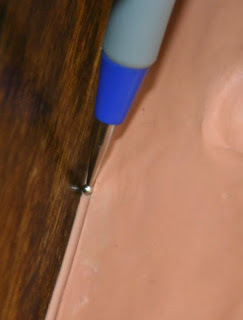 Here is the stylus sealing the edge of the mold in yesterday’s picture. I love this tool! I found these at a hobby store that catered to military miniatures, and they are particularly handy for sanding hard to reach areas of hard surfaces like resin. They are more rigid than the sanding pads, and can be bend at angles when needed. They come in four different grits, with the finest pretty comparable to 600 grit sandpaper. Most of these tools are pretty inexpensive, but it is really the time saved (and frustration avoided) that makes such a difference. Hopefully some of them will prove useful to others. That’s because the first Oliver casting came easily out of the mold. Sorry for the grainy picture, but it is dark outside so the studio has very little natural light at the moment – but I had to share!